BLOOMINGTON, Ind. – Thirty-one incoming Indiana University freshmen have been selected as William R. Fry Scholars by the Kelley School of Business. Incoming freshmen who are directly admitted to the Kelley School are eligible for the Fry Scholars Program. Preference is given to students who are traditionally underrepresented in the field of business. Fry Scholars receive funding for standard tuition and fees and a stipend for living expenses. They also receive support in the form of an advisor and a "Fry Buddy," a Kelley student mentor, during their first year at IU. They also have the option of residing in the Kelley Living Learning Center, a residential program that focuses on personal, academic and professional development. The scholarship program is made possible through a $15 million gift in 2008 from the late William R. Fry, a Kelley alumnus. 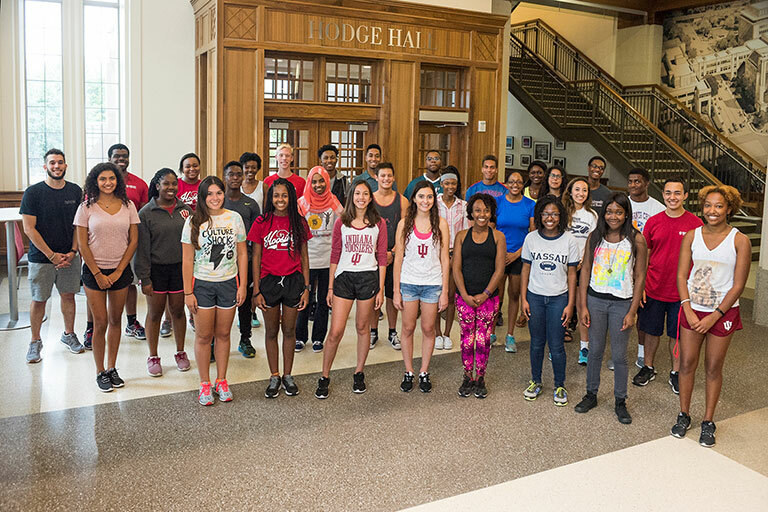 The gift and resulting program are helping the Kelley School pursue a major initiative toward more inclusiveness and increased enrollment of underrepresented minorities. This year's class of Fry Scholars was selected from a group of top students admitted to IU, who were invited to apply for the program because of their outstanding academic records. The application included a high school transcript, a personal statement, essays and a resume. A native of Winamac, Ind., Fry made a number of significant contributions to improve life in communities where he lived. But he said in 2008 that he especially liked the impact his Kelley School gift would have on young minds. Fry attended IU and was president of his senior class in 1958; president of his fraternity, Sigma Chi; and a member of the campus's ROTC program. After graduation, he served for five years in the U.S. Army in South Carolina and in South Korea. Afterward, he joined American Fletcher National Bank. After a five-year stint as a stockbroker with Merrill Lynch, Fry returned to American Fletcher, where he remained until 1983 and ultimately became senior vice president and chief investment officer of its trust department. After American Fletcher, Fry started an investment management firm, Progressive United Corp., in Indianapolis. Seven years later, he began a successful career in radio. He eventually owned five stations in Shreveport, La. After selling the radio stations in 1999, he managed his investments while living in Las Vegas before returning to Indiana in 2008. Victoria Anderson, Millbrook High School, Raleigh, N.C.
Leah Ashebir, Avon High School, Avon, Ind. Dawn Bakare, Rockbridge Academy, Elkridge, Md. Christian Baldwin, Fishers High School, Fishers, Ind. Jordan Benard, University School Milwaukee, Mequon, Wis.
Jake Dufinetz, Hamilton Southeastern High School, Fishers, Ind. Jalen Garrison, Providence-St. Mel High School, Bolingbrook, Ill.
Austin Holmes, Hamilton Southeastern High School, Fishers, Ind. Anna Kozak, Carmel High School, Carmel, Ind. Peyton Marshall, Mishawaka High School, South Bend, Ind. Brian Mitcham, George Walton Comprehensive High School, Marietta, Ga.
Hanan Mohamed, Bloomington High School North, Bloomington, Ind. Breana Owens, Ballard High School, Prospect, Ky.
Nailah Owens-Johnson, Hamilton Southeastern High School, Fishers, Ind. Christina Randall, Center Grove High School, Greenwood, Ind. Donnesha Robinson, Carmel High School, Carmel, Ind. Austin Rocha, Boone Grove High School, Crown Point, Ind. Ronnie Salters, Olive Branch High School, Olive Branch, Miss. Jonathan Smith, Ravenwood High School, Nolensville, Tenn.
Dorothy Vincent, D.C. Everest Senior High School, Weston, Wis.
Simone Watts, Oak Park & River Forest High School, Oak Park, Ill.
More information about the Fry Scholars Program is available from Brittani Wilson, director of diversity initiatives, or Luke Leftwich, director of the undergraduate program, at 812-855-4474.